Many will remember the TV detector vans that stalked suburban Britain in the 1970s. 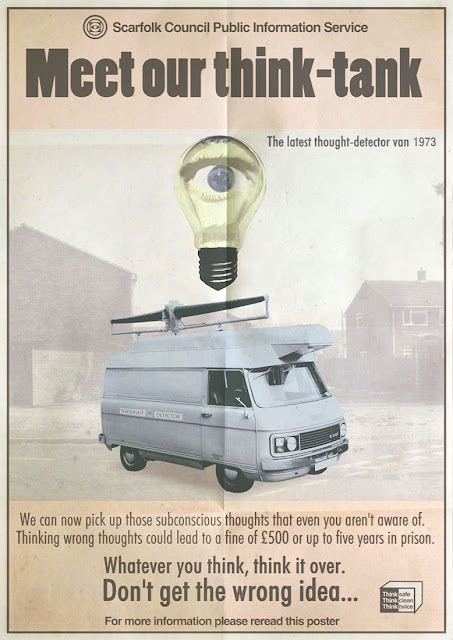 Scarfolk was chosen to take part in a government scheme that tested the latest technology in thought detection, particularly because of the events surrounding "The Tim Seven" in 1972 (See here and here for more details). The scheme not only successfully reduced the number of telepathic crimes in Scarfolk, but also exposed hundreds of "wrong thinkers." According to legislation, "a 'wrong thought' is a thought, which, when thought, contains themes thought to be not right, therefore wrong, and therefore prosecutable. An unthought thought may be potentially wrong, but the thought will not be prosecutable until such a time that the thought has been thought and its themes have been thoroughly thought through and deemed wrong by the authorities. Thinking about which specific thoughts may or may not be prosecutable may also be prosecutable." In 1975 the mayor's brother, Winston, was one of the 90 people arrested for a "wrong thought" involving TV newsreader Angela Rippon, a jar of Robertson's Marmalade, and garden Swingball. surely that should be a bayonet bulb if this is '73? and the revised commer van was 1977. jus sayin. Scarfolk got all the latest in surveillance technology ahead of everyone else. The Commer van was only released commercially in 1977. Before then, test Commers, such as the one above, were secretly used by spies, thought-detection teams, and parent-teacher associations. Screw bulbs have been around since the early 1900s. I saw one the other day, outside the WAVY LINE store... or was it all just a dream? We used to go to our kids football in a Commer van. The whole team on milk crates being thrown around on every bend and laughing our heads off. You could get prison for treating kids like that these days! Thought-crime in Britain back then was just a metaphor employed by writers. Winston? I remember him, wasn't he released in 1984? Oh yeah the detector vans. When we knew they were coming down our street our parents used to unplug our brains and hide them in the gas Meter cupboard. TV test card & "The Scarfolk Nurse"
"Is your mummy who she says she is?"